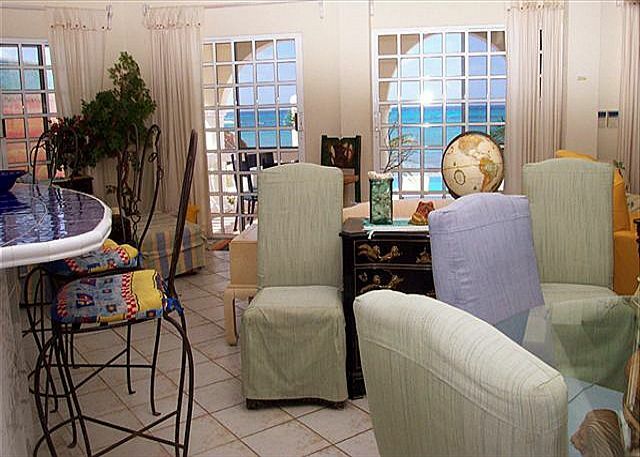 Villa Dos 5 to 6 Bedroom Villa Direct Beachfront - VIlla Dos 6 BR Villa directly on San Francisco Beach! 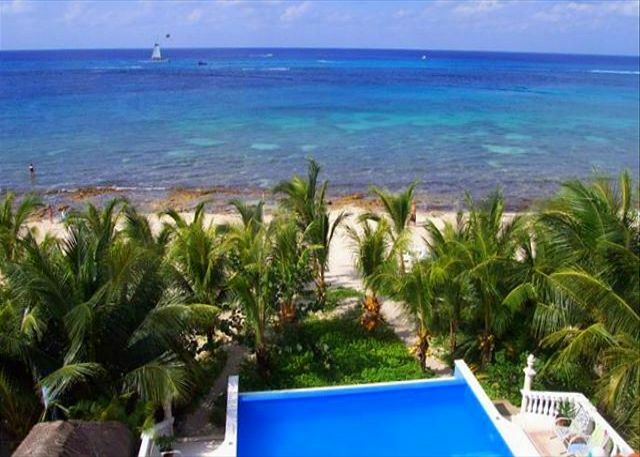 Imagine yourself in one of those beachfront villas/ mansions you see built on the sandy beach on the south side of Cozumel; only a 2-minute boat ride away from the most awesome reefs in the world. 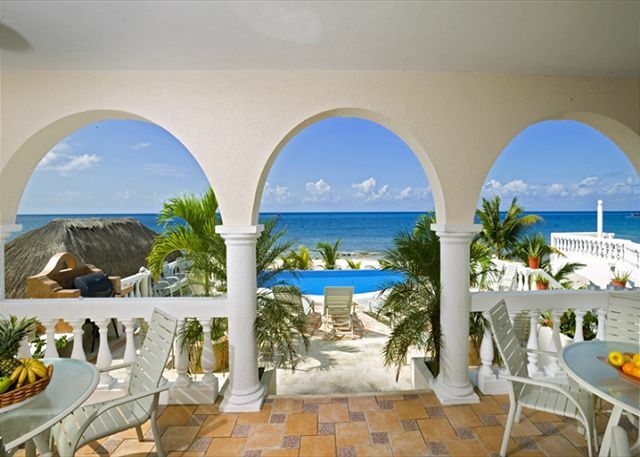 Well, if you were staying at Villa Dos on Cozumel, you wouldn't be imagining anything. 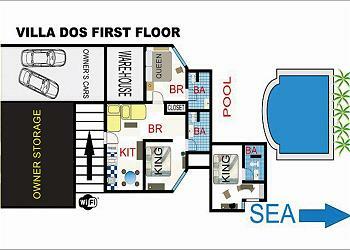 Villa Dos is located in an exclusive area 9 miles south of town called San Francisco beach. Dive Boat Pick-up, umbrellas, beach floats, kayaks, catamaran sailing, parasailing, and snorkeling gear and snorkel trips are available at nearby beach clubs. 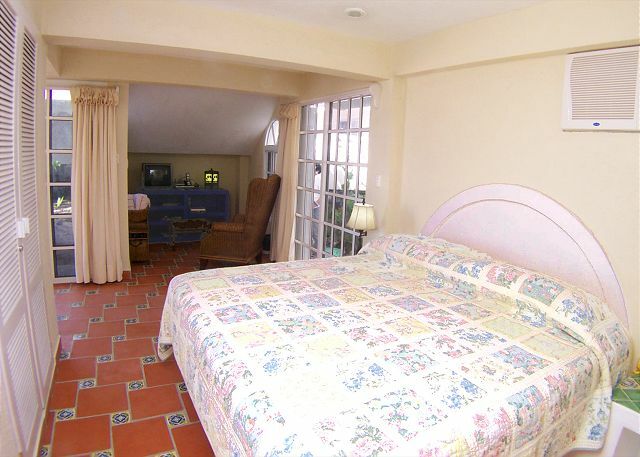 You will find the laid back town of San Miguel 15 minutes to the North. FREE LOCAL CALLS plus FREE LONG DISTANCE CALLS TO THE US AND CANADA AND FREE HIGH SPEED Wi-Fi INTERNET, FULLY AIR CONDITIONED, MAID SERVICE INCLUDED. 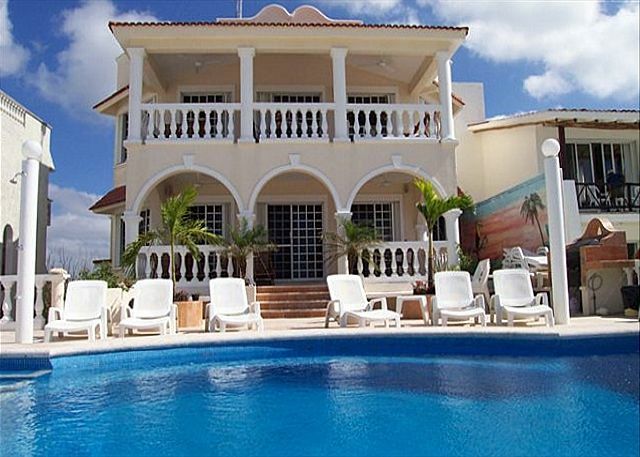 Villa Dos is a 5 -6 bedroom, 7 bath luxury oceanfront villa with... 3 king sized bedrooms and baths + 1 bedroom with 2 queen sized beds and bath, + one bedroom with one queen bed and bath, + and one daybed area with 2 twins which can convert to a king if needed, or just the 2 twin beds plus it has its own bath upstairs on the main level. 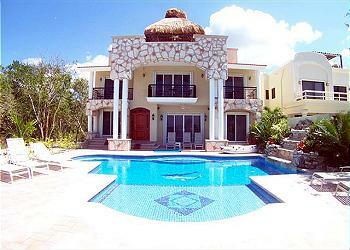 Villa Dos is for rent to large or small groups... If you don't have a large group, we can actually lower the price and make it affordable for just a couple of people, or a small family to rent; or if you have an even larger group and need additional space we can offer you 2 additional houses.. located side by side next to Villa Dos. 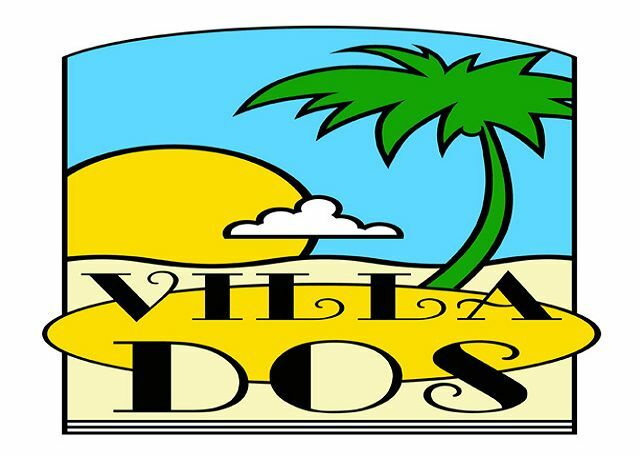 Villa Dos is comprised of living/bedroom areas, (some with their own entrances) surrounded by large outdoor areas which can be easily used by a group or family or recommend Villa Dos is very well suited for groups of 12, and there is comfortable sleeping place for 14 guests. 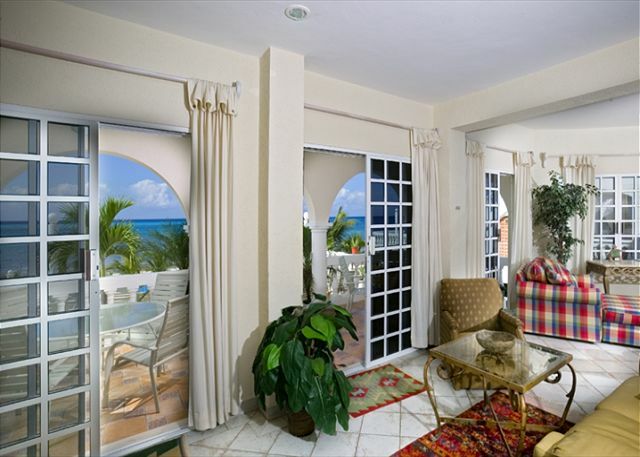 Various areas open onto either the oceanfront swimming pool, a lush garden and large patio or a flower-filled tile-covered terrace and of course the sandy beach and the ocean. Flexible Rate... according to number of guests. 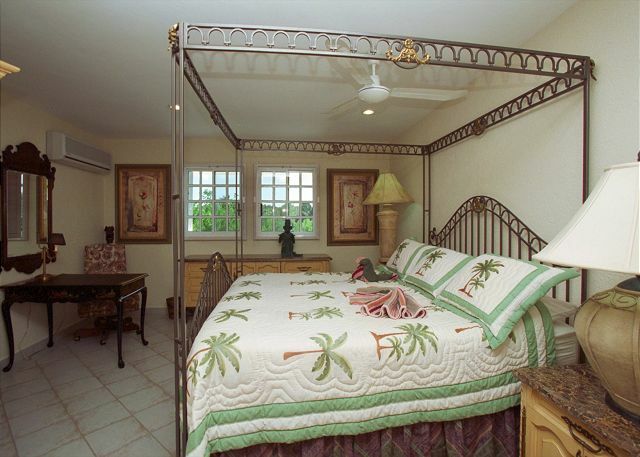 Because of the nature of the furnishings collected by the owners over the years; no children under 10 years old. 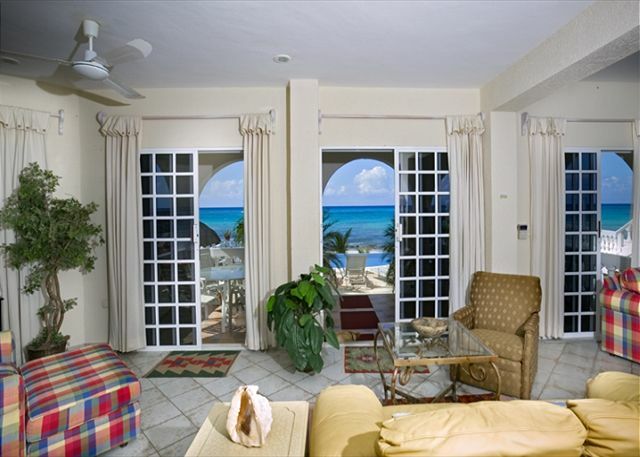 In order to maintain the villa and keep everything in the best condition, this villa has the owners onsite in addition to two caretakers. 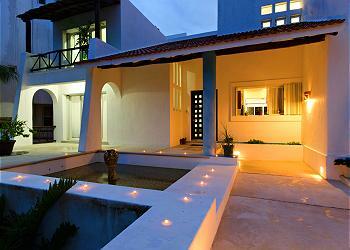 If the owners are not present then an English speaking person will be provided to greet you at the villa. thanks for all the help on this, and thanks Jeanie as well for opening up your home. 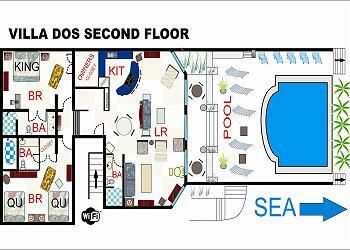 what a wonderful place, very spacious, clean and perfect for a family. the pool was great place for the kids to come hang in the afternoon. the staff was great there as well too. As this was our second time to stay in this lovely home, it was we had hoped. Marisol was the daily housekeeper and she kept the place impeccable! lots of sand coming in and out was no problem for her. There were games tucked away for the family to play at night, plenty of room to spread out and be by oneself our celebrate as a group. The cooks that came each day were absolutely wonderful. They took in to consideration the dietary needs of the group; one vegetarian, one disliked eggs and one did not like onions. With all of these restrictions, our daily Mexican dinners were unbelievable! Kudos to Lucy and Kandy! The daily visit's to Carlos and Charlies or the Ocean Beach club were within walking distance but far enough away to not be bothered by the cruise crowd. We did have beach wanderers stop and sit under the palms on our section of the beach but it was not a bother at all. Everyone very friendly. No one to hustle and bother you but so different from in town where the hustle never stopped. All and all it was rated as best vacation, we will be back. Million dollar view for a few hundred dollars! great location just far enough away from all the cruise ships / clean / great views / awesome pool / AC / great kitchen/ comfortable beds / we will be back! Thank you. Our family (12 people) stayed for a week at Villa Dos in late Feb 2014. Over all the house is beautiful but there were a few flaws. The bedroom below the pool had a very bad musty odor which wouldn't go away. 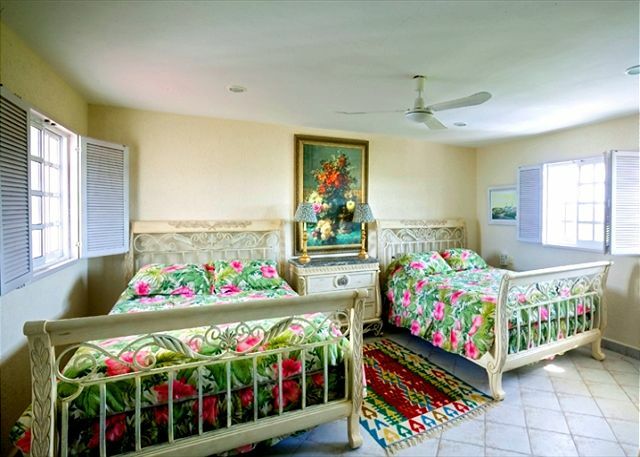 The other two lower bedrooms also had somewhat of that same odor but not as bad. The water pump was so loud in these bedrooms also. The property manager was extremely helpful in places to go, restaurants etc. and our representative from At Home in Cozumel were very responsive with our requests also - thank you!! And our housekeeper and groundskeeper were great - thank you! The location was absolutely beautiful and our trip was great! Our family gathered here at Villa Dos for a Christmas holiday traveling from NJ, Dallas-Fort Worth and Denver. Our ten member group ranged in ages from 13 to 67. We all thoroughly enjoyed our stay at Villa Dos and look forward to returning. The gracious, well appointed home was perfect in all aspects. The actual setting on the beach is more beautiful than the pictures. The sunsets are perfect. 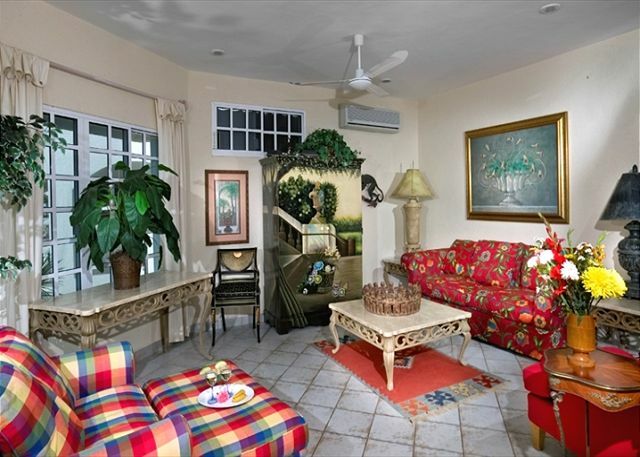 The common area in the house and the veranda and pool area was perfect for family gatherings while the bedrooms provided places to retreat. The house is fully equipped with everything you need. we'd read a lot about Janie so we were sorry to miss meeting her. However, the owner's caretaker Mark was incredible and welcoming. He arranged scuba/snorkeling trips for us with an outstanding dive master: Hernan. How incredible to just walk down the beach and out on dock to be effortlessly taken out to the most beautiful water in the world. And additionally, Mark is quite an accomplished underwater photographer. Thrilled to be able to take home the underwater pictures of our family! I'd highly recommend booking Mark's chief friend for dinner as well. Also, try out his recommendations on the east side of the island for a totally different experience. Villa Dos exceeded our expectations. We utilized the meal service plan, and the food and service from Lucy & Norma was fantastic! They were accommodating, on time for every meal and took great care of us. The property location is very nice. The beds weren't very comfortable, and the linens were below average. All of the furniture had slip covers on it, which was uncomfortable. Also, access to the washer and dryer was not permitted, and only after practically begging were we allowed to do a load of laundry. With an 8 day stay and 10 people, we didn't think it was asking too much. There were 9 of us staying at villa dos. The room set up gave each one of us the privacy to feel as of we were not with a big group. 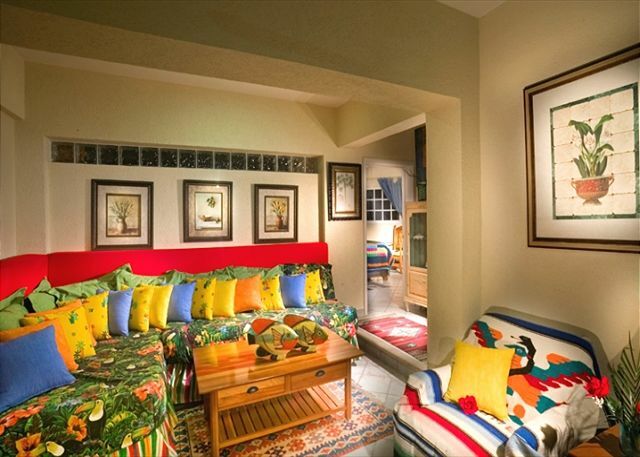 Everyone could hang together or have complete privacy in their own quarters. Great home in a great location. We were extremely happy with the entire process. From talking with Annette (multiple dates! ), checking in at the house, staying there, conversations with the owners (great help & tips! ),daily maid service not to be beaten, all the way to a great checkout day. So much better than several hotel rooms for our family of 7! We had a good experience. Home has way too much furniture but everything worked and Jannie was great. Anything that came up was handled immediately. Beach had rocks so entry was a little rougher. Had to move down a little for easier entry. Kitchen had everything. Plenty of fresh water for every room just in case. Daily maid and outside clean up sure made it a easier trip. We rented vechiles and got around pretty easiely without any problems. Went to the other side of Cozumel to Coconuts for lunch one day and played golf at Cozumel Country Club that was better than expected. Definately enough to do on the island. Yes we shopped at Mega and were back there several times without any issues. Mega makes shopping for yourselves a non issue. Scuba and snorkling and sailing all real close. Some of the bedrooms were pretty dark but the kids loved it allowing them to sleep without any issues. We had full family with 10 adults and one 16 month old. We cooked in 4 of the nights had catereded in from Rock and Java on arrival night that was great and do not forget their desserts are outstanding. We had extras that lasted several days. The carrot cake and brownies were out of this world. We did not do the on site cooking package because we ask each family group to be responsible for dinner one night. One night we had the people from Paradise come in and do massages for everyone. Hated to leave and would stay longer if possible next time. Rented a Hobie Cat one day and did the snorkel sail trip one day. It doesn't take long to slip into total relaxation mode. 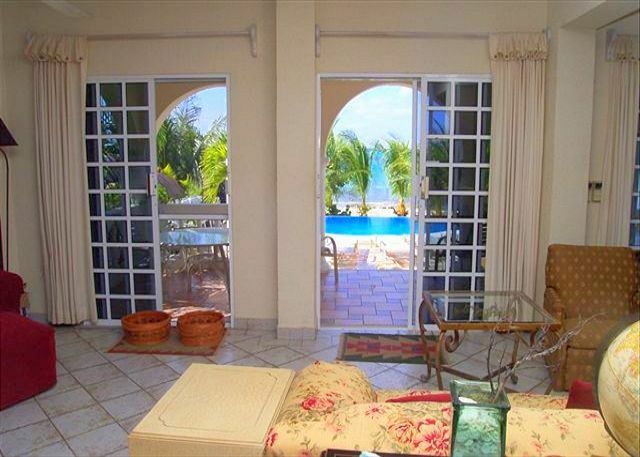 A beautiful view, a great location-private,yet plenty to do nearby. A great place for a family get-together. free phone calls to the US.I cannot imagine a nicer place to spend a week with friends and family. 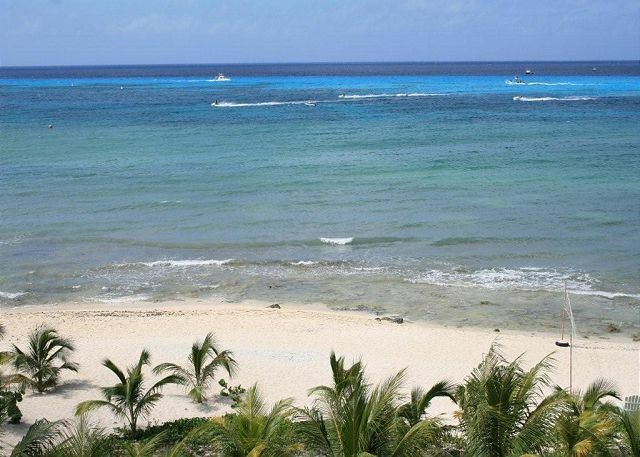 We have been to Cozumel 10 times, and stayed in many different places, but this is the best by far. Each morning we were picked up at the pier for days of diving and fishing.. 15 minutes away we were able to drive into town for the local fun, but at our vacation home we were able to tuck away and enjoy the intimacy of being a family with the congestion of other tourist. I would recommend this house, only thing I noticed was the musky smell in the bottom suite due to the proximity to the pool. Thank you Sabrina! We are so glad you had a good time. We did investigate the musty smell. 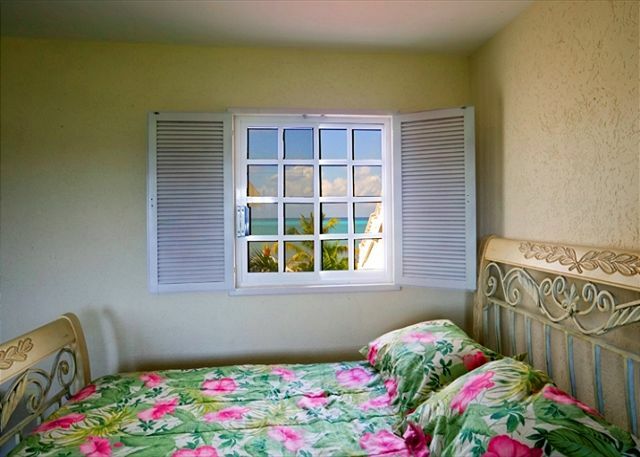 The room is small and right next to the ocean. If we run the a/c for about two days before arrival then there is no smell. Thank you for letting us know. My stay at villa dos was just what the doc ordered. We were there for the ironman race watching a few participants. The property was just perfect. The beach and water was great. Nice infinity edge pool, modern appliances-- even an electric juicer! You need a rent car if you want to go to town a lot, but we cooked bfast and lunch there. 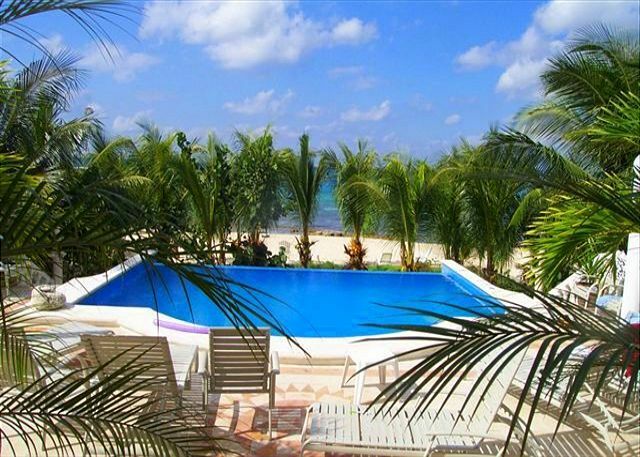 Private, but just a two minute walk from a big time bar and public resort with all the water sports. The dive boat will come to the pier three minutes walk from your pool. Great spot for a big family or dive group with six or seven couples. 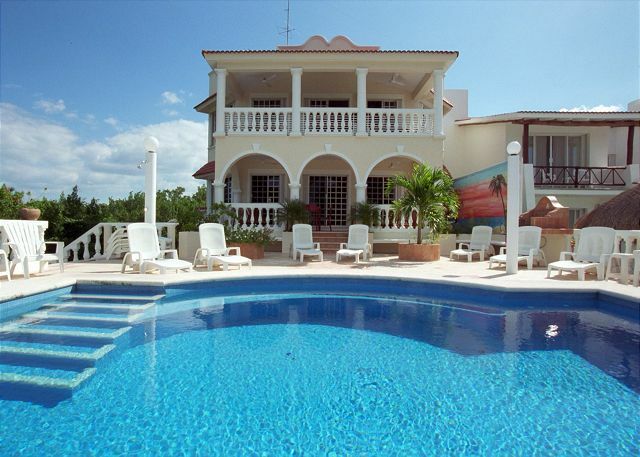 One of the nicer villas at a bargain price! My second trip there, but not my last. very nice place to stay. very friendly staff. cook staff was exceptional. We love the Chango and the Dos. 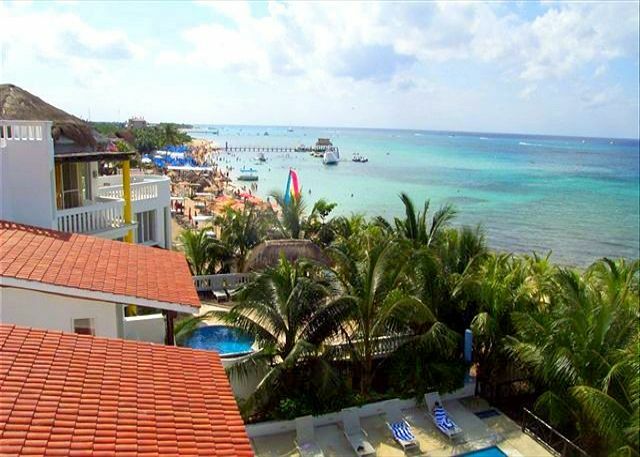 There are 26 of us that get together every 2 years and go to Cozumel and stay at these houses. It is a GREAT location with GREAT staff. We wouldn't stay anywhere else!! 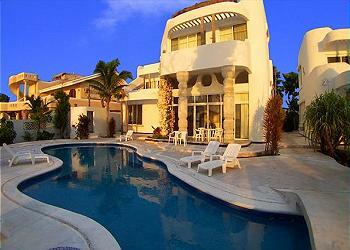 We went to Villa Dos for Ironman Cozumel with a group of 11 people. The house was so spacious we never felt crowded. The cooking staff were so kind and talented. Great food with local flavor. The location is perfect too because you are just next door to San Francisco beach and the local beach side bar /restaurant. 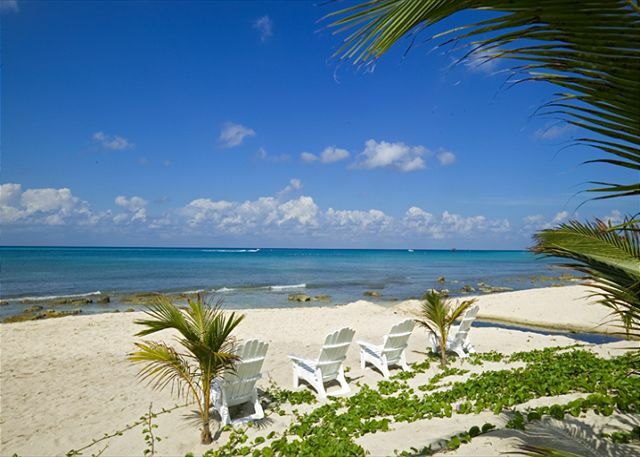 The staff at At Home in Cozumel were very helpful with daytrips and answering local questions. The house had wifi and free long distance to the US & Canada. All in all highly reccomended. The one downstairs bedroom does get a bit damp/musty but this didn't compromise our stay in the room in the least. We have stayed at Villa Dos three times over the past 6 years. 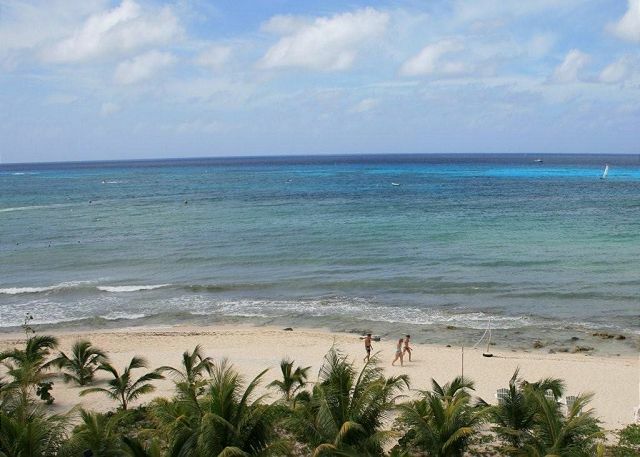 We love Cozumel, the people, the island, the food, the diving and Villa Dos. 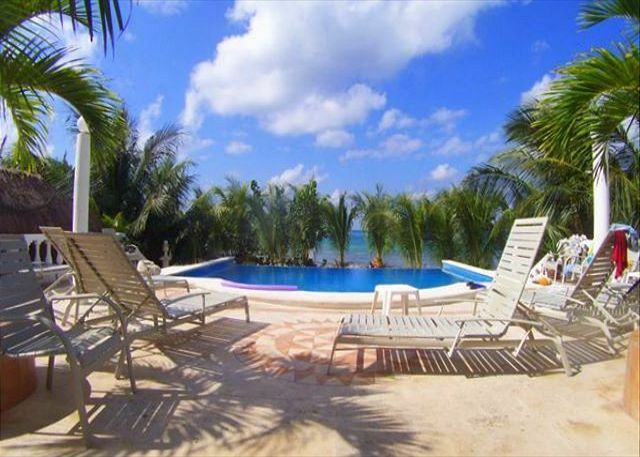 It is a great house on the best beach location in Cozumel. We strongly recommend this home and the staff is great and the owners take great pride in this home. 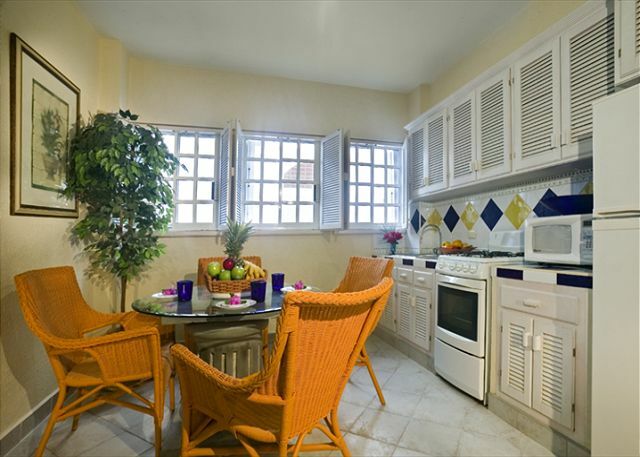 Villa Dos is an excellent vacation choice for adults with a relaxed lifestyle. 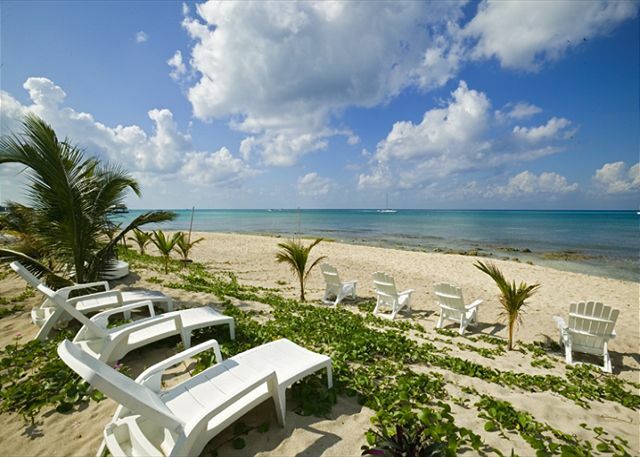 It offers a unique opportunity not available at a resort or all inclusive - the ability to completely immerse in the local culture, food, and of course the tantalizing aquamarine waters just outside your doorstep. 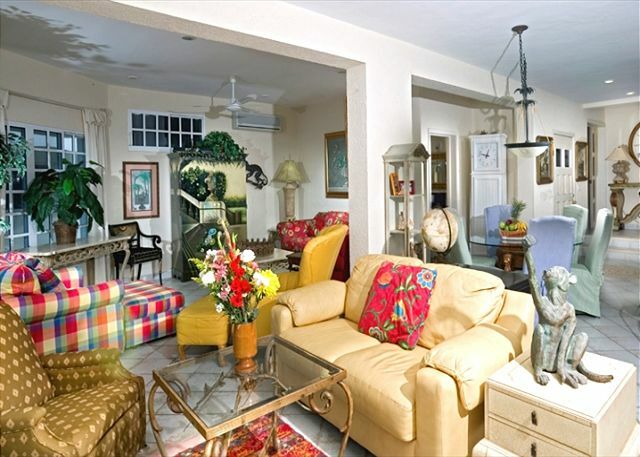 Our group of nine adults loved the layout - widely separated bedrooms offer complete privacy, but the central living/dining/media rooms provided a luxurious and comfy spot to gather for meals,surf the net, watch TV. And the meals - spectacular! We had chef Luis for the duration of our stay, and every morning woke to freshly brewed coffee, a hot breakfast and large platters of fresh fruit. Every evening Luis pampered us poolside with appetizers and special cocktails created to enhance the theme of the evening meal. Luis artfully combines fresh ingredients to make Mayan and Yucatan specialties - everything from Snapper Veracruz to a wickedly spicy mole. Every meal was completed with a frozen or flambeed dessert - to die for. Luis you are the greatest! 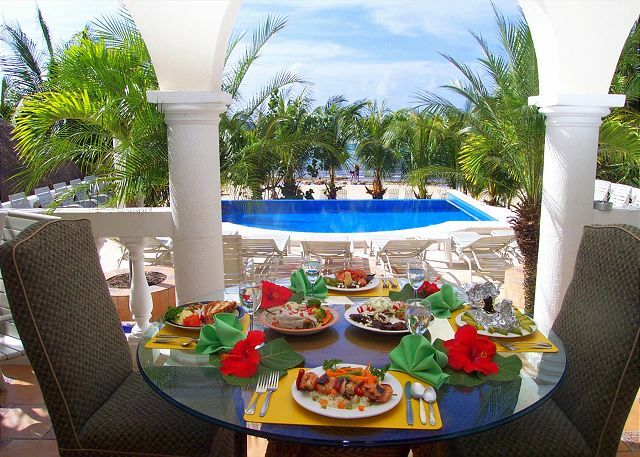 Villa Dos is ideally located - walk five minutues down the beach in one direction to dive and snorkel boats - walk five minutes the other direction for a massage on the beach, parasailing or lunch with your feet in the sand at Carlos and Charlies. 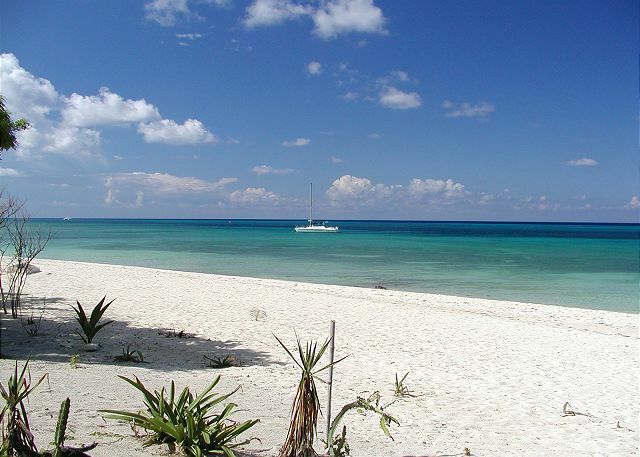 Recommended excursions include tours of Tulum and Cozumel Mayan ruins with knowledgeble guides. Also unforgettable -dancing under the stars on Sunday night in the town square with local families - grandmas to babies in strollers - all turn out for this event. Be sure to rent a car to visit the "wild" backside of the island - pounding surf on volcanic rock and huge sweeps of white sand and crashing waves make for memorable photos. We had a great time and the accomodations were better then expected. The staff was very helpful and extremely friendly. I also highly recommend the meal plan - every meal was outstanding. 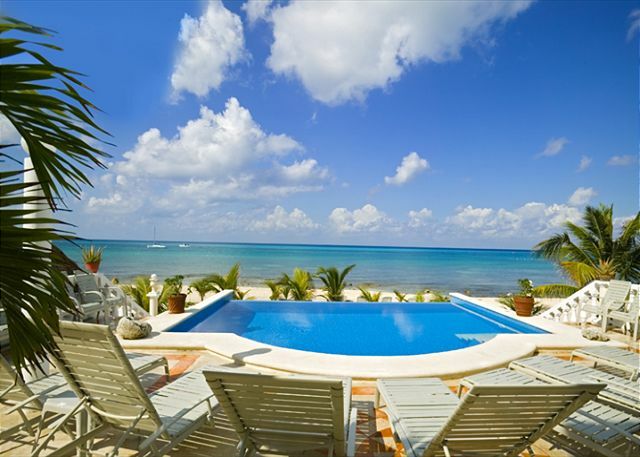 We love Cozumel and will return with Villa Dos as our first choice. Loved the place. Can't wait to get back! Hiring the cook was an excellent decision! We couldn't have been more pleased with the place! The cook was a good decision, and made our stay even better. Will definately be back for more. The pictures and discription of the property are very misleading. The house is poorly designed, the lighting is horrible, like a nursing home. It is advertised like a six bedroom, but its only a four, with two creepy, old basement apartments, and the owners live in the house as well which is not comfortable. The house really is the worst we have ever rented hands down. Let me start by thanking you for completing our Guest Survey regarding your recent stay at our property. I apologize for not exceeding your expectations. We strive to ensure each and every guest experience is satisfying. Please know that we are taking your feedback to heart. It is our hope that you will give us another opportunity to serve you. 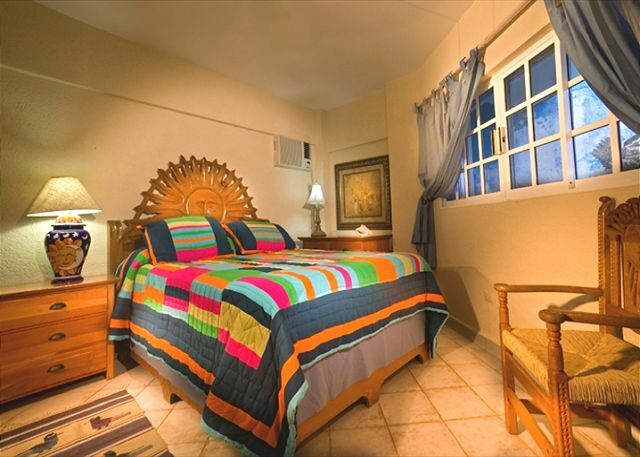 We feel like we are really accurate regarding the exact rooms descriptions and up-to-date photos; the ground floor access bedrooms are liked by many of our guests. Again, I apologize for the inconvenience during your stay and hope to see you again soon. 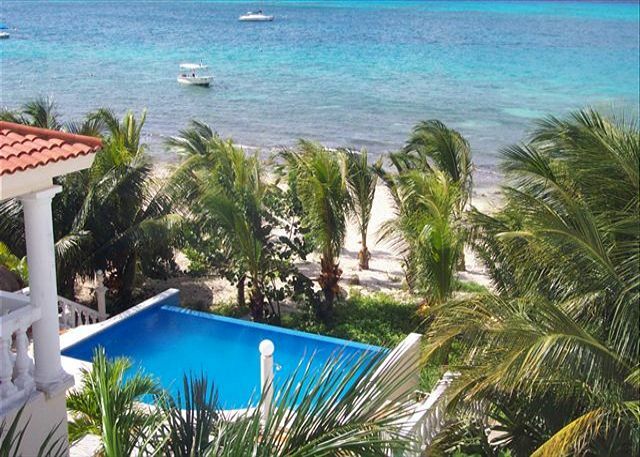 If we can provide any assistance, don't hesitate to contact us directly; At Home In Cozumel. We used part of the house for a small management meeting. The property was beautiful, including architectural details such as tiling and paint. Many individual rooms with separate entrances allow privacy, but the common space is very suitable for a large group. We will be back with spouses. PROPERTY COULD USE AN UPGRADE, AS KITCHEN CABINETS NEEDED PAINTING, DISWASHER WAS NOT SECURE TO THE WALL. OWNERS WERE ON SITE AND VERY ACCOMODATING WITH ANY REQUESTS. OVERALL, A GREAT EXPERIENCE. Wonderful House in a great location!! All the staff were great and we highly recommend the chef service! What a vacation!! I rated the property manager as I did because we did not ever see the property manager. In all fairness that may be because the actual owner of the property lives on site. 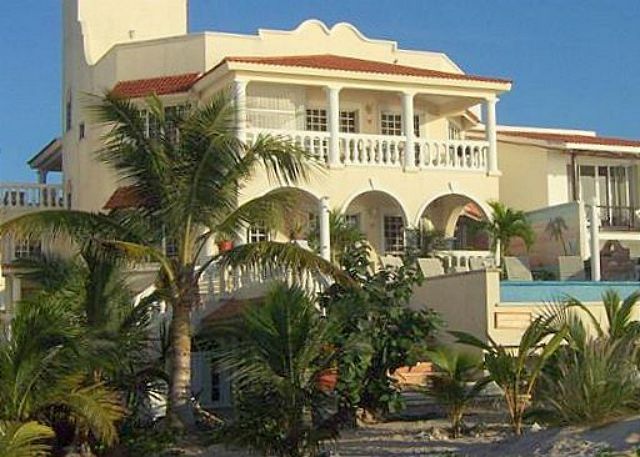 A group of 9 business oweners chose 700 Villa Dos as our retreat location. The accomodations were perfect. The staff was amazing and everything exceeded our expectations. Meals at the house were better than most meals we ate on other parts of the island. I would reccomend 700 Villa Dos to anyone who wants a hassle free vacation where you want to optimize your free time and enjoy the island. 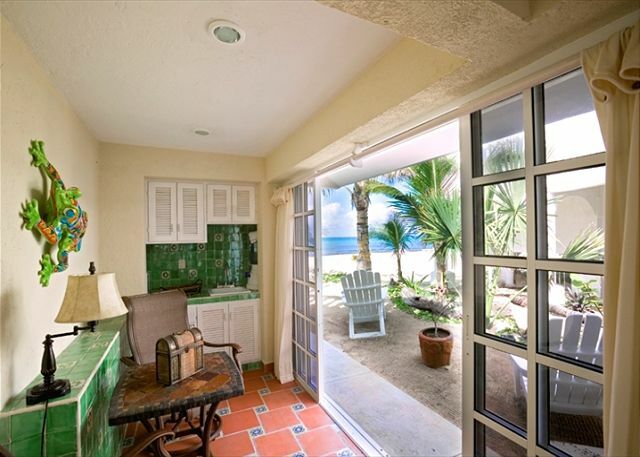 Villa Dos is a beautiful ocean front home on San Francisco beach. 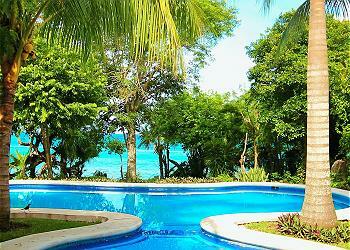 The grounds and house are well kept and the pool is great. 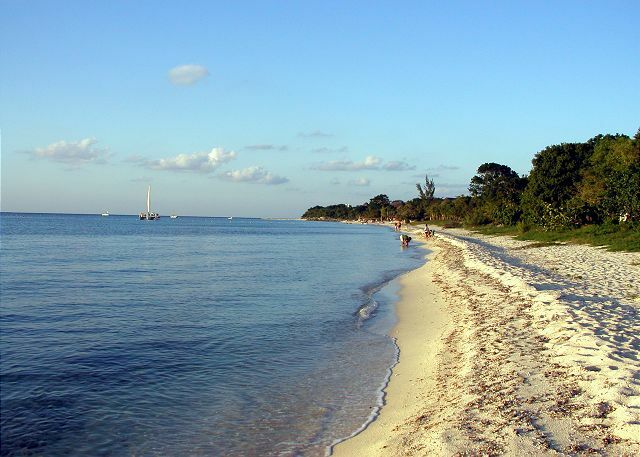 The beach area is very nice but I would recommend wearing water shoes as it is quite rocky at the shore line. Also if you plan on visiting other areas of the island or shopping downtown much a car is really necessary as it is several miles to town and taxis could get expensive after a while. 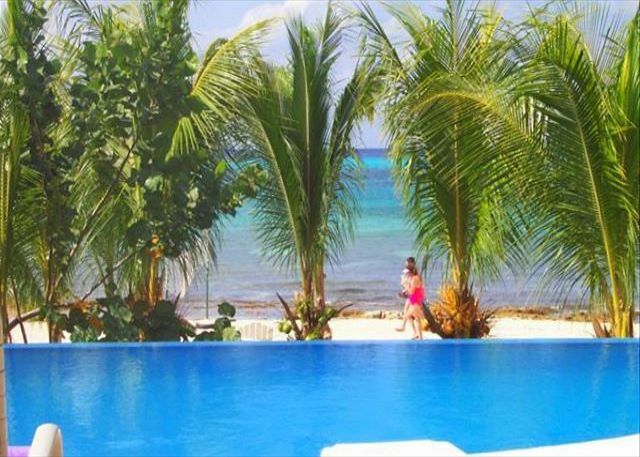 We took our small children and we all had a wonderful vacation in Cozumel at Villa Dos! I would definately stay there again. 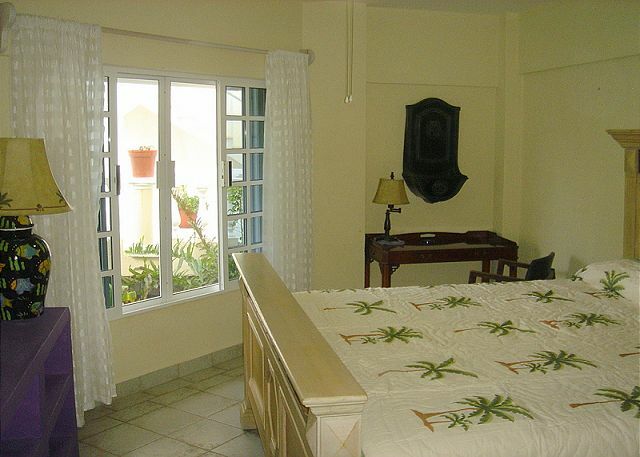 This was the second time we stayed at Villa Dos, and it was still great. 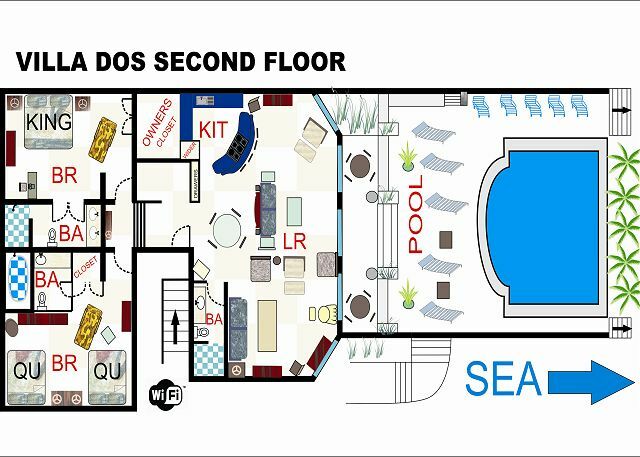 2) There are only two rooms who have access to the kitchen and living room with keys. The other rooms have a key to the gate padlock, which is good, but the other five rooms are locked out of the kitchen, unless they wake up the people in the two room next to the kitchen. You should provide keys to the other guests so they can get into the kitchen. We are so glad to welcome back return guests. And we appreciate your detailed and constructive sugestions. We have passed this along to the owner. Thanks. 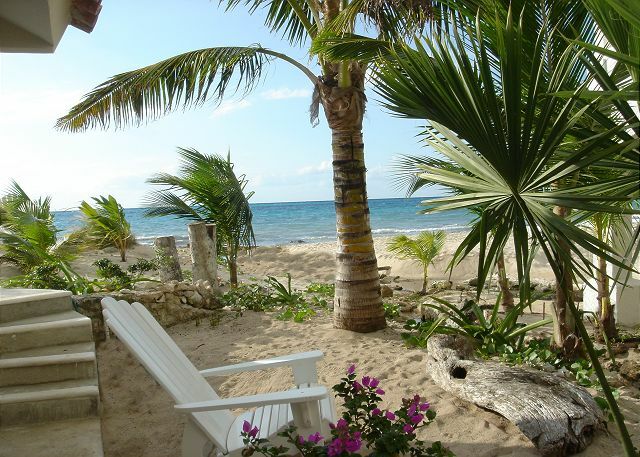 At Home in Cozumel. 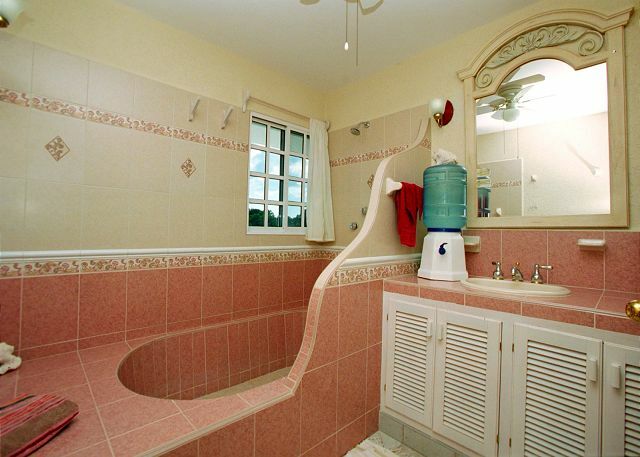 Perfect property for a group that likes to spend time together....that also wants a little privacy. On site staff is incredible and very helpful. Wonderful furniture..inside and out. Can't wait to return to Villa Dos! Villa Dos is a great house. The wonderful furnishing almost manage to distract our guests from the view. Almost. I know that the staff loves having appreciative guests. Thank you so much for you kind comments. We loved it so much, that we are renting it this year too. The home was located on the beach and was so beautiful. The sunsets were amazing. The location was perfect close to town but yet far enough away that it wasn't crazy with cruise ship traffic. My teeage kids were able to still enjoy themselves at the Wyndum hotel so they were able to join kids their age. We could rent anything from any of the other facilites close to us. We felt that even though the place was clean and Jenny and David the owners were wonderful and warm and helpful, some of the rooms were a little musty. Also bring bug repellent. 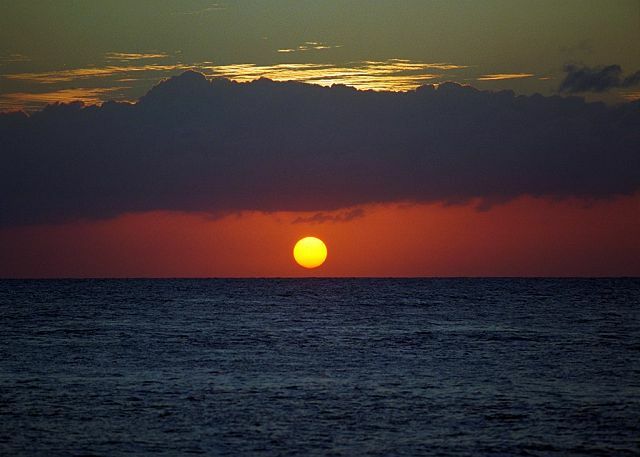 There are no seums after the sunset. We loved our cook for the week and the house keeper Rosa was sweet. We enjoyed ourselves tremendously. 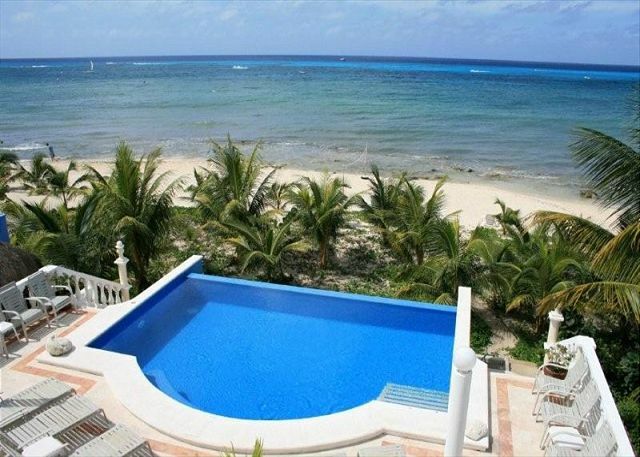 The days on the beach and the tidel pools infront of the house was wonderful. We saw crabs, and an eel. What a great week!!! the house was nice, except there was a damp moldy smell in the lower bedrooms.the appliances in the kitchen were just ok.
We loved it there. We had a great family vacation. The only problem was that a downstairs bedroom, which should have been one of the nicest, smelled so bad that we couldn't use it. Some sort of sewer problem, I think - perhaps remedied by now. OUR GROUP THOROUGHLY ENJOYED OUR WEEK AT VILLA DOS. GREAT LOCATION ON THE BEACH. SEVERAL BAR/RESTAURANTS JUST A SHORT WALK UP THE BEACH.WENT DIVING THREE DAYS AND OUR BOAT FROM ALDORA DIVERS, PICKED US UP, AND DROPPED US BACK, IN FRONT OF OUR CASA. PERFECT WEATHER ALL WEEK. LOVED THE POOL. 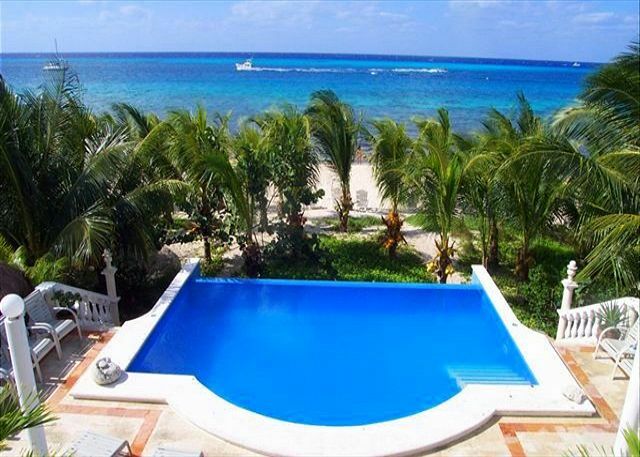 This home is truly on the very best beach in Cozumel--San Francisco beach. 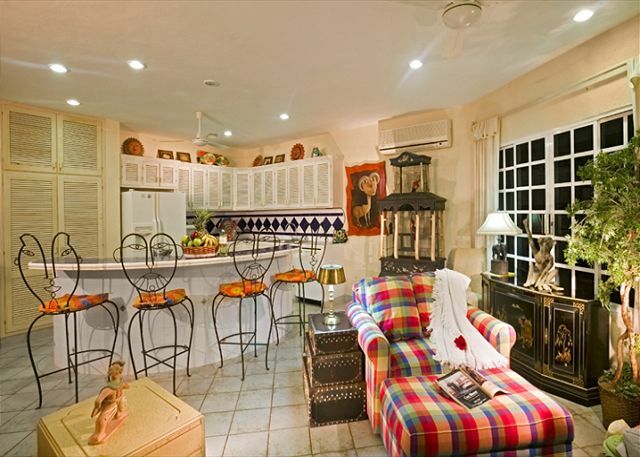 The house is beautifully decorated and furnished and the owners and the staff are so accomodating. You will come back to this home over and over again. 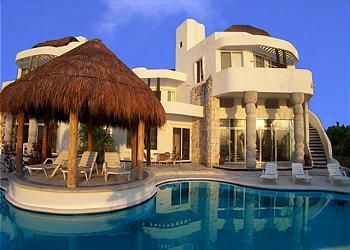 We rented both the Villa Dos and the Chango Villa. There were 26 of us. The house was in a perfect location and accomodated our group easily. The infinity pool is awesome. Definatly a place I would rent again, in fact we are all planning a trip for 2010 for both houses again! !